My life has changed considerably over the past few years. When I started blogging my daughter (who is currently a year shy of being in Kindergarten) was just born. We had just moved back to Indiana to be closer to our family and I was running consistently and at my lowest weight since Junior High. I began blogging because, like many of us, I had a need. Deep down inside I needed to be accepted. I needed people to validate me. I found my self-worth in every retweet, in every share, in every "favorite" or follow. I built up a decent size following on Twitter and I was running pretty consistently. I did a couple of half-marathons and blogged all about them. Despite having a decent following, I wasn't happy. As I have reflected on my running/blogging days I realized one thing - blogging made running a chore for me. Before I was blogging about running I loved it. I loved the thrill of challenging myself and setting goals and then beating personal bests. I loved going for random runs and not feeling like I had to run home and upload pictures from my run on Instagram. I began the miss the days of not having to download all of my run details to upload to Facebook so that I could get a bit of gratification from people who liked or or shared a picture of mine. I haven't ran consistently for a long time - a long time as in almost two years. I told myself I didn't want to run because my life was busy, which is/was true, but really it was because of the memories it brought up. The memories that running became something that I wanted others to validate me in. That every step and every stride was me trying to prove to others that I'm worth the space I maintain on this earth. That I'm not a complete total waste of flesh and bone, but my view has changed. You see a few years ago I wrote this..."God is continually reminding me that my goal is to please Him and not any man." The reason I quit being a running blogger is because I am more than a runner or a blogger - I'm creation of the one who created the world. Knowing that I've been created by the one who created the Grand Canyon, the sand on the beaches and every star in the sky is more gratification than I could ever receive from blogging. I'm not saying I won't blog about my running adventures, but it won't consume me or my blog. Because my purpose on this earth is more than running. This morning all over Central Florida the big news story was a missing 11 year old boy not too far from my home. As a parent, youth pastor and a frequent substitute teacher in the local schools this story scared me to no end. I can't imagine the idea of my child or one of my students just not coming home at the end of the day. There was a sense of relief when later this afternoon I read that the boy was found safe not too far from his home. It is in this boy's story that I hope all of the students I interact with are able to learn a lesson. The reason this boy did not return home was because he had missed curfew and so he was afraid of the trouble he was going to get into for being late. 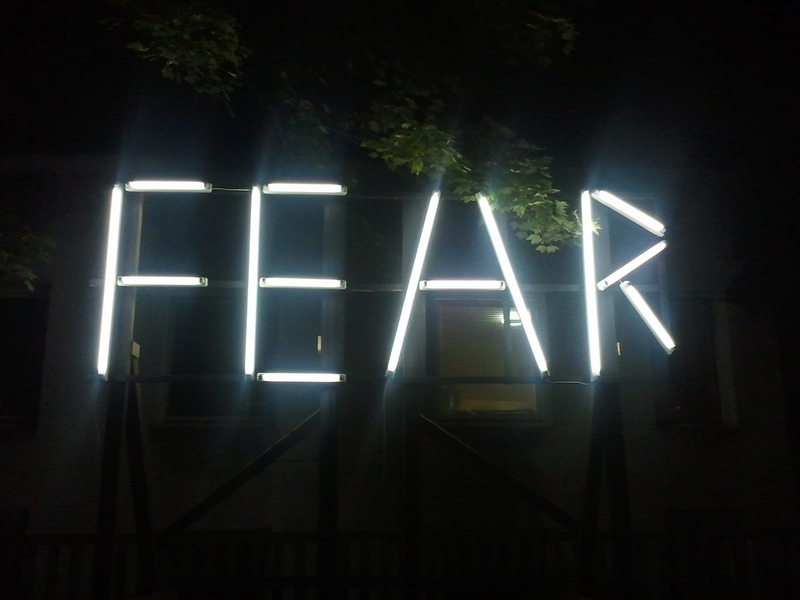 Fear is a powerful emotion. Fear causes us sometimes to do crazy things. Fear causes us not think clearly. If my students learn anything from this story it is that sometimes when we make mistakes or we mess up we have to deal with consequences no matter how scared we are for the punishment. It is when we let fear control us that we often make our circumstances 100,000% worse. Think about this situation for a second...he comes home a few minutes late. His parents maybe lecture him, ground him or take away his iPhone for a few days. End of story. But instead this boy chose to let fear control him. And his fear caused a massive search of the community. It caused all of the local TV stations, radio stations and social media accounts to be aware of his situation. So the next time you find yourself in a tough situation, don't let fear make it worse. Don't let fear control you. Understand that your actions have consequences and deal with it, but most importantly learn from it. I'll never forget walking into the room and seeing my Grandpa asleep in the hospital bed that had been moved in to the makeshift bedroom in my grandparents living room. The disease that had taken over his body destroyed him from the inside out. He was a fraction of the weight that he normally was and looked nothing like the man I'll remember him as. I was back in town for a job interview that would relocate our small family within miles of my grandpa. I had missed the ups and downs of his sickness, but knew that the man laying in that hospital bed was not my grandpa. As I walked out of the house to get in the car to board the airplane I knew that I was saying goodbye for the last time. I'll never forget getting to have one-on-one time with my grandpa during my trip. He was there weak and barely able to talk, but he kept mentioning how he had always wanted to visit the Kennedy Space Center in Cape Canaveral, FL and I immediately felt the urge to return to the coast. I felt the need to do something and see something for a man that never got the chance to. I wanted to do it in remembrance of a man that would do anything for anyone, even if it cost him time, energy or money. In March of 2014 my wife and I relocated to the Space Coast and are about 15 miles south of Kennedy Space Center. Every time I have the opportunity to step out and see a rocket launch up into the sky I think about how one of the world's greatest grandpa's would have loved the opportunity to see what I was watching. I can't watch a launch without thinking of him. This past week I got notification that I have been chosen for a rare opportunity to receive media credentials to KSC for the opportunity to get up close and personal with one of SpaceX's rockets, meet with NASA engineers, see the KSC facilities and watch the launch from a reserved section. The events take place over three days and the entire time I'll be soaking in as much as possible because I know my Grandpa would have loved the opportunity that I've been granted. So as I get to watch the fruits of some of the sharpest minds in the world be launched into space I will stand proudly knowing that while I have a great seat in the reserved section, my Grandpa has a much better view. Be sure to keep up with me as I tweet and Instagram this once in a lifetime opportunity.